In its Weekly Report On Israeli Human Rights Violations in the Occupied Palestinian Territories for the week of 09-15 January 2014, the Palestinian Center for Human Rights (PCHR) found that, during the reporting period, Israeli forces wounded 13 Palestinian civilians, including 2 children and a woman, and an international activist, 10 of whom were wounded during weekly protests throughout the West Bank. One was wounded at the northern entrance of Ayda refugee camp and 3 others, including one civilian and 2 members of an armed group, were wounded in airstrikes in the Gaza Strip. Israeli forces conducted 72 incursions into Palestinian communities in the West Bank. At least 66 Palestinians, including 7 children, were abducted. Israeli forces established dozens of checkpoints in the West Bank. At least 2 Palestinian civilians were abducted at checkpoints in the West Bank. On 09 January 2014, Israeli forces, backed by military vehicles, moved into Um Sararah area adjacent to Kherbet al-Fakhit (al-Mosafer area), southeast of Yatta town south of Hebron. Israeli forces patrolled the vicinity of the area and deployed on the farmlands. They prevented the movement of civilians and declared it a closed military zone. Israeli soldiers confiscated barbed wire and uprooted a large number of woodland trees, which were less than 1 year old and were planted to establish a nature reserve on a 1000-dunum land donated by the Mehmed family to the Ministry of Agriculture. The project was funded by the Food and Agriculture Organization (FAO). On 12 January 2014, Israeli forces accompanied by officers from the Civil Administration and police officers confiscated a green John Deere tractor belonging to Mustafa ‘Aqab Ban ‘Odah when he was working on a farmland in al-Ra’s al-Ahmar area north of the Jordan Valley, east of Tubas. In the Gaza Strip, Israeli forces carried out 5 airstrikes, 2 shooting incidents along the border fence and 6 shooting incidents at Palestinian fishing boats. 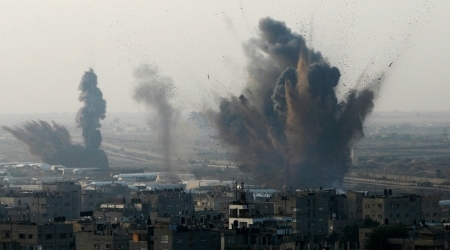 On 09 January 2014, 2 members of an armed group were wounded when an Israeli warplane fired a missile at a motorcycle, east of Khan Yunis, in the southern Gaza Strip. Moreover, a 3-year-old child sustained minor injuries by glass fragments. On the same day, an Israeli warplane fired a missile at a training site belonging to al-Quds Brigades (the armed wing of the Islamic Jihad), west of Rafah. The same training site was attacked again 15 minutes later, but no casualties were reported in either attack. On 11 January 2014, a civilian was wounded when Israeli forces stationed along the border fence east of Jabalia, in the northern Gaza Strip, opened fire at a group young men who were a few meters away from the fence. On 14 January 2014, Israeli forces stationed along the border fence east of Deir al-Balah, in the central Gaza Strip, opened fire sporadically at farmlands for an hour, but no casualties were reported. On 13 January 2014, Israeli warplanes launched 3 airstrikes against training sites belonging to Palestinian armed groups south of Deir al-Balah and northeast of al-Nusseirat, in the central Gaza Strip. As a result, the sites were damaged, and a 3-year-old child was wounded by glass fragments as he was standing with his father in front of a grocery, east of al-Nuseirat. Besides, 2 UNRWA schools and over 20 houses sustained partial damage. In the context of targeting fishermen in the sea, Israeli forces fired at fishermen 6 times on 11, 13, 14 and 15 January 2014, but neither casualties nor material damage were reported. Israel has continued to impose a total closure and has isolated the Gaza Strip from the outside world. The illegal closure of the Gaza Strip, which has steadily tightened since June 2007 has had a disastrous impact on the humanitarian and economic situation in the Gaza Strip. The Israeli authorities impose measures to undermine the freedom of trade, including the basic needs for the Gaza Strip population and the agricultural and industrial products to be exported. For 7 consecutive years, Israel has tightened the land and naval closure to isolate the Gaza Strip from the West Bank, including occupied Jerusalem and other countries around the world. This resulted in a grave violation of the economic, social and cultural rights and a deterioration of living conditions for 1.7 million people. The Israeli authorities established Karm Abu Salem (Kerem Shaloum) as the sole crossing for imports and exports in order to exercise its control over the Gaza Strip’s economy that has been aggravating for years due to the shortage of imports. They also aim at imposing a complete ban on the Gaza Strip’s exports. On 13 January 2014, settlers from “Ma’oon” settlement established on Palestinians lands, east of Yatta town south of Hebron, cut and smashed branches of 20 old olive trees, by handsaws, in Mo’in Valley area belonging to Khader Mos’ef al-‘Amour and his brothers from al-Tawani village, east of the town. On 14 January 2014, around 300 settlers from “Kiryat Arbaa’” settlement and “Hafat Jal” outpost, established on confiscated Palestinian lands east of Hebron, organized a demonstration in Khelet ‘Abdoh area in the eastern area of the city. 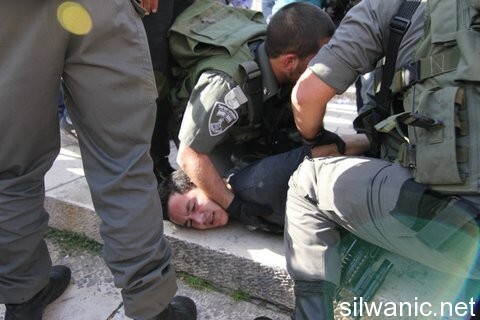 The demonstration was organized under intensive guard by Israeli forces and police. They entered farmlands belonging to the al-Zaro and Abu Rmeilah families, damaging stone chains. They planted a number of olive trees in the lands confiscated by the Israeli forces since 1972, under the pretext that they are military training areas, to which their owners are denied access into them. This comes in an attempt by settlers to seize this land for the benefit of settlement expansion projects in “Hafat Jal” outpost. 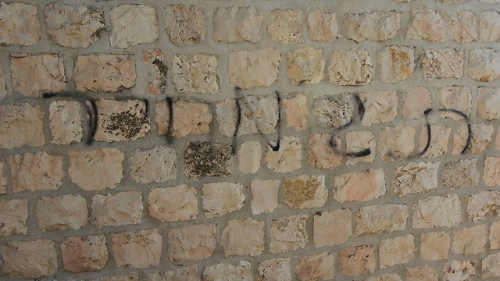 On 15 January 2014, a group of settlers set fire to Imam Ali bin Abi Talib Mosque in Deir Estiya village, north of Salfit, and wrote hostile slogans on its wall in Hebrew. Settlers set fire in the vicinity of the mosque, so carpets at the entrance were burnt and continued burning till fire extended into the mosque burning a part of it. Israeli forces attacked a number of non-violent demonstrations organized by Palestinians, wounding ten protesters. Following the Friday Prayer, 10 January 2014, dozens of Palestinian civilians, with international and Israeli human rights defenders, organised a peaceful demonstration in Bil’in, west of Ramallah, in protest at the construction of the annexation wall and settlement activities, supporting the al-Aqsa mosque and the Islamic and Christian religious sites. Demonstrators took the streets, raising the Palestinian flags and headed to the liberated territories near the annexation wall. Israeli forces had closed all the entrances of the village since morning to prevent the Palestinian and international activists and journalists from participating in the demonstration. Demonstrators marched adjacent to the cement wall and tried to cross the fence before Israeli forces stationed behind the wall, in the western area, and a large number of soldiers deployed along it fired live bullets, tear gas canisters, rubber-coated steel bullets, sound bombs and skunk water at them and chased them into olive fields. As a result, 4 protestors, including a woman and an international activist, were wounded. Moreover, dozens of demonstrators suffered tear gas inhalation, and others sustained bruises as they were beaten up by Israeli soldiers. A 33-year-old civilian sustained a bullet wound to the back; a 19-year-old civilian sustained a bullet wound to the right leg; a 23-year-old woman sustained a bullet wound to the left leg; and a 28-year-old international activist was hit by a gas canister to the left leg. On the same day, dozens of Palestinian civilians organised a peaceful demonstration in the centre of Ni’lin village, west of Ramallah, in protest at the construction of the annexation wall and settlement activities. Demonstrators took the streets and headed to the annexation wall. Israeli forces closed the gates of the wall with barbed wire and prevented the demonstrators from passing to the land behind it before they responded by throwing stones. As a result, a 39-year-old civilian sustained a bullet wound to the right leg. Many civilians suffered tear gas inhalation and bruises as they were beaten up by Israeli soldiers. Around the same time, dozens of Palestinian civilians and Israeli and international human rights defenders organised a peaceful demonstration, in protest at the construction of the annexation wall and settlement activities, in Nabi Saleh village, southwest of Ramallah. Demonstrators took the streets, raising the Palestinian flags and chanting slogans against the occupation and in support of the Palestinian unity resistance and, then, they headed to the lands that the settlers are trying to rob by force, near “Halmish” settlement. Israeli forces closed all the entrances of the village since morning to prevent the Palestinian and international activists and journalists from participating in the demonstration. When they arrived at the land, demonstrators were met by live bullets, tear gas canisters, rubber-coated steel bullets, sound bombs and skunk water, and were chased into the village. As a result, a 14-year-old girl sustained a bullet wound to the right shoulder and an 18-year-old civilian sustained a bullet wound to the back. 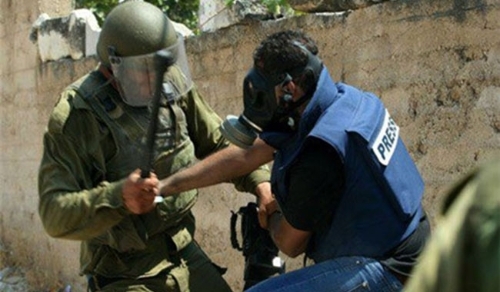 Many civilians suffered tear gas inhalation and bruises due to being beaten by Israeli soldiers. Following the Friday prayer, dozens of Palestinian civilians and international and Israeli human rights defenders organised a peaceful demonstration in Ma’assara village, in protest at the construction of the annexation wall and settlement activities. The demonstration started in front of the Candles Cultural Centre, in the centre of the village. Demonstrators moved in the streets, raising the Palestinian flag. When they arrived at the area where the annexation wall is established, Israeli forces started firing tear gas canisters in attempt to disperse them and prevented them from reaching the annexation wall. At approximately 12:30 on the same day, Palestinian civilians and international activists organised a peaceful demonstration in the centre of Kufor Qaddoum village, northwest of Qalqilia, and headed towards the eastern entrance of the village, in protest at the continued closure of the entrance with an iron gate since the beginning of the Aqsa Intifada. Clashes erupted between the demonstrators and Israeli forces who fired sound bombs and tear gas canisters to prevent them from reaching the aforementioned gate. 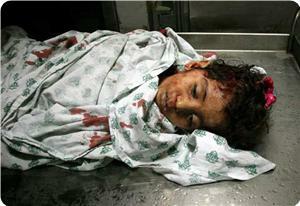 As a result, 3 civilians, including a child, were wounded. A 27-year-old civilian was hit by a gas canister to the leg, a 43-year-old civilian was hit by a tear gas canister to the lower back and a 17-year-old civilian was hit by a tear gas canister to the back. At approximately 12:35 on Sunday, 12 January 2014, dozens of Palestinian children and young men gathered at the northern entrance of Ayda refugee camp, north of Bethlehem. They threw stones and empty bottles at Israeli soldiers who were positioned at the northern entrance of the camp. The Israeli soldiers fired gas canisters and rubber-coated metal bullets in response. As a result, a number of protesters and civilians suffered tear gas inhalation. At approximately 16:00 on Wednesday, 15 January 2014, dozens of Palestinian boys and civilians gathered at the northern entrance of Ayda refugee camp, north of Bethlehem. They threw stones and empty bottles at Israeli soldiers who were positioned at the northern entrance of the camp. The Israeli soldiers fired gas canisters and rubber-coated metal bullets in response. As a result, a 19-year-old civilian sustained a bullet wound to the left leg. He was taken to Beit Jala hospital, where his wound was described as moderate. In addition, a number of protesters suffered tear gas inhalation. The Aqsa Foundation for Endowment and Heritage confirmed that the so-called Israeli Antiquities Authority had carried out 104 drilling operations in Palestinian sites during 2013, including 22 sites in occupied Jerusalem , most notably was in the vicinity of al-Aqsa Mosque. In its statement, the Foundation said that the Israeli excavations aimed at uncovering alleged Jewish monuments and wiping out Islamic and Arab historical monuments as part of Israeli Judaization policy in Palestinian lands. 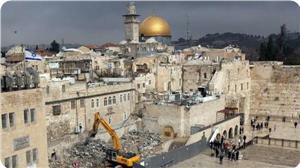 The statement said that 22 excavations have been carried out in occupied Jerusalem including 4 drilling operations beneath and around al-Aqsa Mosque. The United Nations figures show that the annual rate of Israeli settler attacks on Palestinians has nearly quadrupled in the past eight years. The figures released on Wednesday also said that Israeli occupation forces have failed to stop the so-called "price tag" campaign against Palestinians. There have been 2,100 such attacks since 2006, when the UN Office for the Coordination of Humanitarian Affairs (OCHA) started the counting. The annual overalls are up from 115 in 2006 to 399 in 2013. Israeli settlers, mostly armed, regularly attack Palestinian villages and farmers and set fire to their mosques, olive groves and other properties in the West Bank under the so-called "price tag" policy. The extremists say the "price tag" attacks are carried out against any Israeli policy "to reduce the presence of settlers and settlements on the occupied Palestinian land in the West Bank and East al-Quds (Jerusalem)." Israeli officials have repeatedly condemned such attacks, but they rarely detain the assailants. Critics say the Israeli government has not taken enough measures to prevent the attacks. In the third quarter of 2013, Israeli occupation forces committed 89 violations in the access restricted areas in the Gaza Strip, Al-Mezan Center for Human Rights reported. According to the report, the violations killed six Palestinians, including a child, injured 22 citizens and arrested 15 others including three children. The center accused the IOF of continuing its systematic violations of International humanitarian law of human rights through targeting Palestinian farmers, shepherds and fishermen. The IOF targeted any Palestinian cross one kilometer distance in the buffer zone area despite the announcement that the buffer zone area is 300 meters of the borders. Al-Mezan center reported that the sea siege is still continuing and Palestinian fishermen are allowed to fish within six miles nautical only. What is Ariel Sharon's legacy? The eulogies have focused on his decision to pull Israeli settlers out of Gaza in 2005 under the so-called "disengagement plan." U.N. Secretary-General Ban Ki-moon praised Sharon's "political courage and determination." U.S. Secretary of State John Kerry said Sharon "surprised many in his pursuit of peace." The reality is that Sharon's withdrawal from Gaza portended no courage to change his pro-settlement, virulently anti-Palestinian policies. Since the 1970s, when he planned and helped establish 64 West Bank settlements, Sharon had earned his moniker as "the father of the settlements." His evacuation of 21 settlements in Gaza and four in the West Bank seemed surprising, indeed. But the removal of settlers must be seen in the context that overall during Sharon's term as Israel's prime minister from 2001 to 2006, the number of Israeli settlers in the West Bank, including East Jerusalem and the Golan Heights, increased from roughly 388,000 to 461,000. Sharon's legacy is deeply disturbing. He went to his grave without facing justice for terrible things he did. His death is a grim reminder that impunity for human rights abuses and violations of international humanitarian law has plagued Israel and the Palestinians for far too long. It mattered little to Sharon that Israel's transfer of its civilians into Palestinian territories was—and is—a grave breach of the Geneva Conventions and a potential war crime. It mattered even less that the settlement regime and Israel's military rule in these areas subjects Palestinians to severe discrimination and a mountain of restrictions that makes life miserable. Part and parcel of this settlement expansion plan was Sharon's construction of the Israeli separation barrier, which today stands as a monument to human rights violations. Sharon's government approved its construction in 2002, ostensibly to prevent Palestinian attacks that killed 640 Israeli civilians during his term. But the real motivation for the barrier, as countless studies have documented, was to build a wall around the Israeli settlements, deep into the West Bank, cutting off thousands of Palestinians from the rest of the West Bank. Worse, he avoided prosecution for the killings of civilians in which he was implicated: a fact that deserves not eulogy, but infamy. Ban and Kerry couldn't very well mention it, but history will remember Sharon for his role in the massacres of civilians by Lebanese militias in the Sabra and Shatila Palestinian refugee camps in Lebanon in 1982. From September 16 to 18, the militias killed at least 700 people, and perhaps more than 2,000, including infants, children, pregnant women and the elderly, some of whose bodies were found to have been mutilated. Sharon, as Israel's defense minister in 1982, had overall responsibility for the Israel Defense Forces, which controlled the area of the camps. According to a document prepared by his office, Sharon's instructions on September 15, the day before the massacres began, included: "For the operation in the camps the Phalangists should be sent in." In February 1983, the Kahan Commission, Israel's official commission of inquiry investigating the events, found that Sharon bore "personal responsibility" for the massacre. There was a "serious consideration ... that the Phalangists were liable to commit atrocities," the commission reported, but "from (Sharon) himself, we know that this consideration did not concern him in the least." His "disregard of the danger of a massacre" was "impossible to justify," the commission found, and recommended his dismissal as defense minister. Although he did resign as defense minister, in a glaring example of gross impunity for crimes against Palestinians, Sharon remained in the Israeli Cabinet as a minister without portfolio and later became prime minister, serving until his stroke in January 2006. Similarly, Elie Hobeika, the Phalangist leader the Kahan Commission named as responsible for directing the militias, also escaped prosecution and served as a Lebanese Cabinet minister until being killed by a car bomb in 2002. The massacres constituted war crimes and crimes against humanity. Yet Israeli justice authorities did not conduct a criminal investigation to determine whether Sharon and other Israeli military officials bore criminal responsibility. Israel also made sure that no one else could bring Sharon to justice, either. In 2001, survivors from Sabra and Shatila brought a case in Belgium requesting Sharon be prosecuted under Belgium's "universal jurisdiction" law. Political pressure from the United States and Israel -- it "was like nothing I have ever seen," said a colleague who closely followed the issue at the time -- led Belgium's parliament to amend the law in April 2003, and to repeal it in August. Belgium's highest court dropped the case against Sharon that September. Many in Israel are now highlighting Sharon's record as a warrior and bold political leader. But it is worth pausing to consider his record as a man who brought devastation and destruction to the lives of thousands of Palestinians, without ever facing justice for his crimes, and whose policies undermined efforts to achieve peace between Israel and the Palestinians. Defence for Children International-Palestine (DCIP) said “the occupation authorities are still procrastinating to investigate the circumstances of child abuses by Israeli soldiers,” DCIP said it filed a complaint at the Israeli military police about an Israeli attack on Hindi Sultan, 17, Hares village in Salfit city during his arrest on September 19, 2013 where one of the soldiers extinguish a cigarette on the hand of a child and beat him. The organization said it demanded for a lawyer or a member of the child’s family to be with him during the hearing, but the Israeli military prosecution refused, asking that only the child presents himself in the court. The DCIP lawyer Iyad Misk said that the occupation authorities is trying to procrastinate and find reasons to close the file and suspend the investigation into the incident, stressing that by law the child has every right to come with a lawyer or a member of his family when giving his testimony. The DCIP said the Israeli legal authorities’ failure to open an investigation into alleged Israeli ill-treatment and torture confirms reports of Palestinian and Israeli human rights organizations which indicate that Israel rarely holds accountable those committing violations Palestinian children’ human rights. It also testifies that this immunity granted to the Israeli soldiers is a clear message that the state is not interested in stopping the perpetrators of Palestinian child abuses, which contributed to the consistent violations of their human rights. The DCIP pointed out that the reports of the Israeli organization Volunteers for Human Rights (Yesh Din), which monitors the criminal accountability against the Israeli soldiers with regard to human rights violations against Palestinians, suggest that when criminal investigations against suspects of criminal offenses against Palestinians are opened, they are almost end up with failure to find any results. The DCIP said it filed 15 complaints on behalf of 10 children tortured and ill-treated during 2013, five of which were against the Israeli intelligence service, five against Israeli investigators and Israeli police, and five against the occupation army. The IOF also detained Palestine Public TV crew (Yara Alfares/ Correspondent, Salah Alhindi/ Cameraman, Iyad Albargouthi/ Driver) while they were at Ein Yabrood Village east of Ramallah city, and after an interview with the head of the village council about village land confiscation in the village, on Tuesday 10th December 2013. On Thursday 19th December 2013, the Israeli border guards detained the Anatolia Agency photographer Moath Meshaal and Raya FM Radio photographer Samer Nazal at Za'atara checkpoint between Ramallah and Nablus. In the context of physical attacks by the IOF, Palestine TV crew (reporter/ Ali Dar Ali, and cameraman/ Fadi Jayyousi) suffered a severe suffocation after the IOF targeted them directly with gas grenades while they were covering the weekly peaceful demonstration in Bil'in village west of Ramallah on Friday 6th December 2013. The Israeli police attacked the Yediot Ahronoth newspaper photographer Atta E'oissat (43 years), while covering clashes between Palestinians and settlers who repeatedly invaded Al-Aqsa Mosque in Jerusalem city, on Friday 6th December 2013. A week later he was charged with assault on a police officer and he was prevented from entering Al-Aqsa Mosque for two weeks. Wadi Hilweh Information Center-Silwan issued the yearly report where the Israeli violations in the city of Jerusalem during 2013 were monitored. The Center added: “Last year has been marked by the arrest of children as young as ten years old, and the assault of women and Al-Aqsa students (Masateb) as well as the distribution of demolition orders to 200 building at one time in Shu’fat refugee camp while approving or tendering to build more than 4,500 settlement units, despite the start of negotiations to resolve the final issues. During last year, more than 9050 extremists including Ministers in the Israeli government, members of the Knesset, Israeli officials, 2342 Intelligence individuals and soldiers and 1876 “police guests” broke into Al-Aqsa according to the monitoring and documenting of the Islamic Awqaf in Jerusalem. September of 2013 was the most with the most break-ins as it witnessed the break-in of 1595 extremists during “Yom Kippur”, and 1133 extremists broke in during the month of July on occasion of the so called “destruction of the temple”, 1004 in March in “Pesah” holiday and 1007 in May on occasion of the Israeli independence day. The break-ins occur every day but Fridays and Saturday through Dung Gate which the occupation authorities took over when they occupied East Jerusalem and they monitor this program which is refused by the Islamic Awqaf and is confronted by the Marabouts at Al-Aqsa Mosque. The occupation forces prevented the Friday prayer 6 times in Al-Aqsa during last year; four consecutive Fridays in March and April, and two consecutive times in the month of September as they prevented men under the age of 40 from entering and praying. 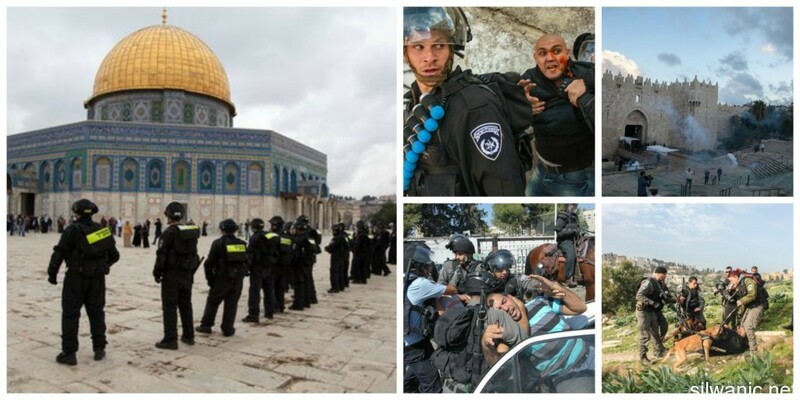 The occupation forces (Special Forces, snipers, Intelligence and Musta’ribeen), broke into Al-Aqsa 13 times last year in the months of February, March, May, September and December. The Israeli authorities isolated more than 350 citizens from Al-Aqsa Mosque for various periods from one week until 6 months with the possibility to extend those periods; among the citizens isolated was the director of the Mosque, Najeh Bkeirat. Some of the main events that took place at Al-Aqsa Mosque last year included a police officer kicking the Holy Qur’an and then stepping on it inside the courtyards of Al-Aqsa, taking off a woman’s veil, attempts to break into the Dome of the Rock in addition to raising the Israeli flag in its courtyards and drinking alcohol. An Israeli settler performed her religious rituals while wearing her wedding dress near Al-Qataneen Gate which directly overlooks the Dome of the Rock. During last year, one Israeli extremist called “Yehuda Galbek” managed to lead daily break-ins inside Al-Aqsa Mosque and despite creating problems in the courtyards and provoking Muslims, the Israeli police cancelled an order that was issued to ban him from entering Al-Aqsa for 6 months, and Avi Biton who is the chief of police in the Old City of Jerusalem promised Yehuda to protect him during his break-ins. Last year recorded a remarkable increase in the arrests of Jerusalemites, and the occupation didn’t exclude children, women, and the elderly or even patients from being arrested. 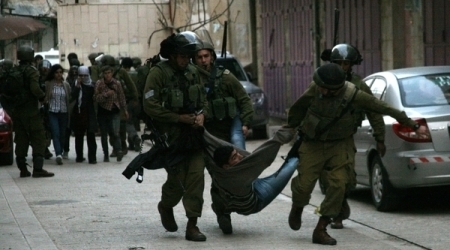 The arrests included citizens from all Jerusalemite towns, villages and neighbourhoods (Esawyeh, Sheikh Jarrah, Al-Tur, Al-Sowaneh, Silwan, Wadi Al-Joz, and the neighbourhoods of the Old City, bet Safafa, Sur Baher, Jabal Al-Mukabber, Shu’fat refugee camp and Beit Hanina). The Information Center monitored last year the arrest of 1450 Jerusalemites including 450 children and 25 women. The months that witnessed the most arrests were the months of March, June and September while the month of February witnessed the arrest of a 5-year old child as he was arrested and detained for an hour inside a military vehicle. The month of January witnessed the arrest of an 8-year old child from Esawyeh and during the last days of December, the Israeli forces arrested 3 sever-year old children from the courtyards of Al-Aqsa. In a serious legal precedent, the police issued an order last November to arrest a 4-year old child from the neighbourhood of Al-Sa’dyeh, and after raiding the family’s home to execute the order, the officer was surprised to find out that Mohammad Zein Al-Majed is only 4 years old and withdrew from the house after threatening the father to call the child for interrogation. Last year also witnessed a violation to the rights of more than 20 children from the neighbourhoods of Jerusalem as they were interrogated in “cells 20” where the child is completely isolated from the outside world by extending his arrest for almost a week and is also prevented from talking to his lawyer in addition to the secret and confidential sessions he goes through; children are placed in solitary confinement that lack the lowest levels of life. The way and methods of arrests during last year were marked by arresting the children from their homes in the early morning hours or after midnight as well as the group arrests that were carried out after the suppression of events taking place in the city. Most of the arrests were done by the Musta’ribeen (undercover police) as they would participate in protests and chant and throw stones with the participants and would then assault and beat the young men and arrest them. Wadi Hilweh Information Center confirmed that the occupation authorities violated the Israeli and International laws by arresting children as they made it a priority to arrest them. The Israeli laws prevent the arrest of children between 8 p.m. and 7 a.m. while most of the arrest in East Jerusalem took place in the early morning hours and the children are investigated alone without the presence of a companion; note that arresting children should be the last method used not the first as the child could be called for investigation with the presence of one of his parents. The Israeli laws require the presence of a companion with the child during investigation in addition to the presence of a specialized children investigator but the case is different in Israeli interrogation rooms and the police claim that they only do so for the benefit of the investigation and not to disrupt it. In order to psychologically pressure the children, the police handcuff the children during the arrest and interrogation which is also a violation of the detention law. The demolition processes by the occupation’s municipality and civil administration continued in the neighbourhoods of the city of Jerusalem during last year. The municipality also forced several house owners to self-demolish their homes and threatened them to impose high fines on them and arrest them if they don’t execute the orders. The Center monitored the demolition of 33 residential establishments (residential buildings, rooms, houses and caravans), and also demolished 15 commercial and residential establishments that were under construction, 12 residential establishments were self-demolished, 35 barracks used for residence and raising sheep. The demolition processes led to the displacement of 446 citizens and took place in Beit Hanina, Shu’fat, Al-Tur, Al-Sowaneh, Esawyeh, Silwan, Sur Baher, Jabal Al-Mukabber, the Old City of Jerusalem, Beit Safafa and Salah Eddin Street). In an assault on the history and civilization in the Old City of Jerusalem, the Israeli bulldozers demolished last February arches and buildings in the form of arcs located on the north side of the Buraq Square in preparation for the implementation of the scheme to build a Jewish religious center in the arena known as the “House of Strauss” which will consist of 4 floors with an area of ​​900 square meters, and will be used as the main entrance to the tunnels underneath Al-Aqsa Mosque. The demolition and dredging were focused in 2013 on the areas that are threatened to be confiscated in favour of the so-called “national parks” project in Jerusalem (Al-Tur, Esawyeh, Jabal Al-Mukabber and Silwan). These processes were done under the supervision of the Israeli Nature and Parks Authority. In addition to the demolition processes that were carried out under the pretext of “building without a permit”, the Jerusalem municipality does not grant building permits for residents of East Jerusalem because of the impossible conditions and huge amounts of money that accompanies the licensing procedures that stretches for many years. The nightmare of demolishing houses pursues thousands of residents in Jerusalem after the municipality had distributed demolition orders in the neighbourhoods of Jerusalem. The largest campaign was in Shu’fat refugee camp and the adjacent neighbourhoods (Ras Shihadeh and Ras Khamis) as the municipality distributed demolition orders to 200 buildings where 16 thousand people live, not to mention the notices that are distributed on an ongoing basis in all neighborhoods of Jerusalem. The occupation authorities also issued demolition orders to two Mosques in Silwan; the women’s chapel in “Mohammad Al-Fateh” Mosque in the neighbourhood of Ras Al-Amoud and “Al-Qa’qa’” Mosque in the neighbourhood of Ein Al-Lozeh. The Information Center points out that there are three types of demolition orders that the Jerusalem municipality distributes on the residents of East Jerusalem. The most dangerous one is the “administrative order” which allows the municipality’s staff to demolish the property in 24 hours; this is becoming the most common order nowadays and is usually distributed in the areas targeted by the Nature and Parks Authority. Another type is the “Judicial Order” which is issued by one of the Israeli courts and is postponed several times. The last one is the “land cleaning” which has been used in the past two years and allows the municipality to bulldoze wide areas of land under various pretexts. During last year, the extremist Jewish groups from “Price Tag” carried out several attacks against Islamic and Christian sanctities in addition to the assaults on the residents inside their homes or while working and even when walking in front of their homes. During last year, the “Ma’man Allah” cemetery was attacked twice and racist slogans were written on its walls and the tombstones of graves. Al-Nabi Daoud Mosque was also attacked and its Ottoman tiles and frontispiece were broken. Three other assaults were recorded on Christian churches and they are: “Church of the Dormition”, “Protestant Church”, and “Latin Church” as racist slogans against the prophet Issa were written and more than 30 gravestones were broken in the Protestant Church in the area of Nabi Daoud. A group of Jewish settlers also assaulted the Latin Church in Silwan south of Al-Aqsa Mosque and broke gravestones and wrote racist slogans. During last year; 4 Jerusalemites were stabbed using sharp tools and suffered minor to severe injuries, 23 citizens were assaulted using hands, rocks, sticks, glass and sharp tools; 10 citizens were sprayed with pepper gas. Among the people assaulted were 7 children, 5 women and 6 taxi drivers. Also, 65 cars were damaged where the settlers burnt 3 of them and slashed the tires and wrote racist slogans on the rest. On the other hand, the union of “Ateerat Lyoshna” seized two commercial stores in the old city, under the pretext that they were Jewish property before 1948. The settlers also tried to seize an apartment that belongs to Jaber family in Shu’fat as they tried to manipulate the Israeli Magistrate Court decision. Several more attacks carried out by settlers living in the Jerusalemite neighbourhoods were also recorded as they attack the residents with the help of their guards who often randomly fire live bullets. In the context of the attack on the land and property, the Israeli Magistrate court ordered the family of Siam to evacuate their house which is located in the western neighbourhood of Sheikh Jarrah in Jerusalem. The family has been living in the house since the 60’s of last century and the custodian of absentee property claims that the family only lives there since 1968 so that the family will lose all their rights and also requested the family to pay 40 thousand NIS to freeze the evacuation order. The settlers also tried to confiscate a house and a piece of land in the neighbourhood of Al-Tur in addition to their attempt to confiscate a property for Rweidi family in Al-Ein in Silwan as the settlers appealed the District court’s decision which confirmed the ownership of the land to be for Rweidi family; note that the property consists of 3 floors (5 residential apartments) where 30 people live and is owned by Jom’a Mohammad Salem Darwish Rweidi. In the context of settlements, the occupation continued the suggestion of new settlement projects and continued the building of settlements even during the negotiations period which resumed four months ago. The occupation authorities ratified the building of 2433 residential units during April, August and last October. They also ratified the building of new settlement units in the courtyard of Lions Gate “Giv’ati parking” that is established at the entrance of Silwan, and also ratified the project of “National Park” on the lands of Esawyeh and Al-Tur last November which will confiscate 740 Dunoms of land owned by Jerusalemites. The Israeli government also decided to build 2015 settlement units in the settlements of “Pisgat Zeev” in Beit Hanina and “Har Homah” in Bethlehem, and “Ramat Shlomo” in Shu’fat, and “Gilo” in the village of Beit Safafa. Also, parts of the Separation Wall that separates the city of Jerusalem from the villages of Ezaryeh and Abu Dis were demolished by Jerusalemite activists and Beer Nabala to emphasize the right of citizens to reach to the occupied city of Jerusalem. The Israeli forces also demolished the tent “Sumoud Al-Zaytoon” established on the lands of Shu’fat several times; note that the lands are at risk of being confiscated in favour of Road 21 which connects the Israeli settlements with each other. They also demolished the sit-in tent in Sheikh Jarrah that is established in front of the house of Shamasneh family several times last February as well as demolishing a sit-in tent in Esawyeh that was put up to support Samer Essawi while he underwent the open hunger strike. 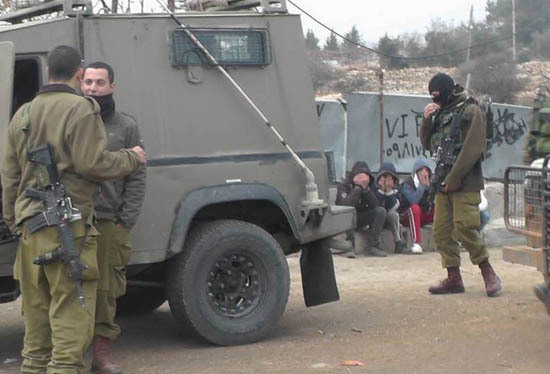 The occupation forces also harassed activists in the sit-in tent in Beit Safafa to challenge Street number 4 which aims at confiscating wide areas of land and separating the people of the village. During last year, the occupation forces managed to suppress the freedom of speech in Jerusalem by preventing all activities (social, sports and national) that were organized indoors and outdoors. They banned activities to support prisoners, Al-Aqsa, a march on Women’s Day, Earth Day, against Street number 4, Prawer Plan, week of Palestinian Child, the memory of late President Yasser Arafat, the Jerusalem Spring festival and a sports marathon. They also managed to target journalists and paramedics during events and incidents by chasing and assaulting them and arresting them sometimes. The educational problems continued in the city of Jerusalem during 2013 where there was a lack of classrooms and not building new schools by the occupation’s municipality which forced the citizens to register their children in schools far away from their residence. The municipality closed the 6th grade in “Bi’er Ayoub” elementary school in Silwan at the beginning of the school year due to the lack of classrooms and distributed the students over several schools that are far from their homes. The schools most affected in 2013 were: Al-Aqsa where school was suspended for 6 days to secure the settlers break-ins; note that Al-Aqsa has 3 schools and they are: (children elementary school, secondary girls’ school and secondary boys’ schools) and has around 500 students. The education was disrupted several days in Dar Al-Aytam School which overlooks the gates of Al-Aqsa Mosque and sound grenades were fired inside the school. The Israeli forces also arrested two students from Al-Zahra’ School and Al-Aytam while they were in front of their schools under the pretext of throwing stones. Wadi Hilweh Information Center’s cameras monitored the Israeli violations in the city of Jerusalem during the year 2013 which included break-ins at Al-Aqsa Mosque, praying in the streets of the city after the Israeli forces prevented the young men from entering Al-Aqsa and the demolition of houses and displacement of dozens of residents. The cameras also monitored the suppression of various activities in the city and the clashes in the neighbourhoods in addition to raiding neighbourhoods and distributing demolition orders. 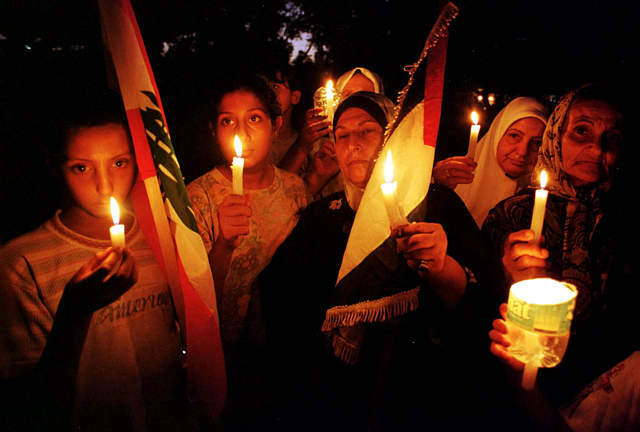 Relatives of the victims of the Sabra and Shatilla massacre carry candles on the 18th anniversay of the massacre, September 15, 2000. Israeli justice authorities never conducted a criminal investigation to determine whether Sharon and other Israeli military officials bore criminal responsibility. 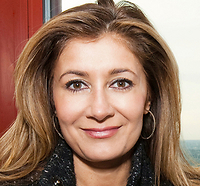 In 2001, survivors brought a case in Belgium requesting that Sharon be prosecuted under Belgium’s “universal jurisdiction” law. Political pressure led Belgium’s parliament to amend the law in April 2003, and to repeal it altogether in August, leading Belgium’s highest court to drop the case against Sharon that September. During Sharon’s term as prime minister, Israeli forces killed more than 1,430 Palestinian civilians, while Palestinians killed 640 Israeli civilians, according to data collected by the Israeli rights group B’Tselem. Israeli forces also unlawfully demolished hundreds of homes in the West Bank and in the Gaza Strip. The UN office for the coordination of humanitarian affairs in occupied Palestine (OCHA) said that two Palestinians were killed and 25 others were wounded by either Israeli troops or settlers during the first week of 2014. In a report released on Saturday, OCHA stated that an 85-year-old Palestinian from Kafr Qaddum village, east of Qalqiliya city, had died last week after he had inhaled tear gas fired by Israeli troops at Palestinian homes. It added in its report, which covered some of the Israeli violations that took place from December 31, 2013 until January 6, 2014, that a 16-year-old boy was also killed and three others suffered injuries in Gaza when they were targeted by Israeli soldiers at the pretext of their presence near the security fence. It noted that 17 Palestinian citizens suffered different injuries during Israeli violent attacks on the weekly anti-settlement marches of the West Bank as well as on Palestinian towns, villages and refugee camps. Five Palestinians, including a female child, were also wounded by Jewish settlers in Nablus and Al-Khalil cities during the reporting week, OCHA affirmed.